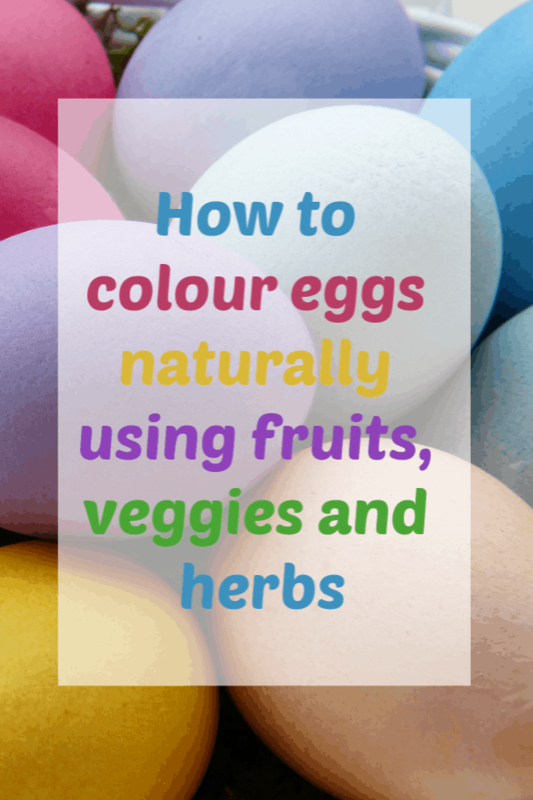 We’re getting to that time of year again where the schools are challenging children to decorate eggs creatively so today, I thought I’d share some ideas on how you can colour eggs naturally. I’ve seen a few egg colouring kits appearing in the shops over the last few weeks and although I haven’t bought one, it looks like they’re just tablets of colour that you add to the water when you’re boiling your eggs. That got me thinking that there must be some natural colourants that you can use instead – just like when we had a go at dying fabrics with food a while ago. I’ve done lots of research (what did we do before Google?) 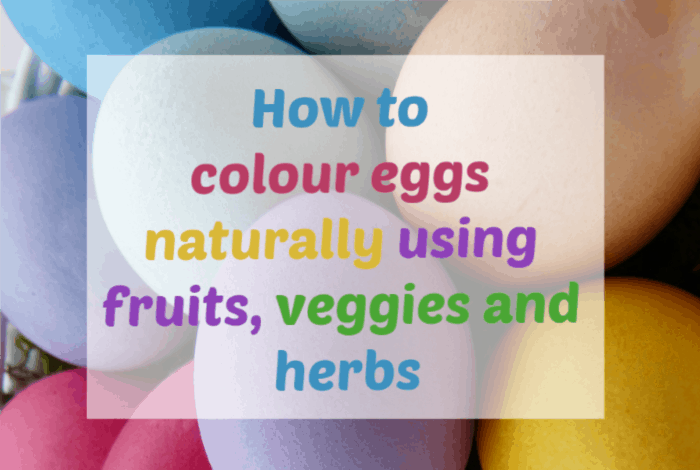 and it’s actually really easy to colour eggs naturally – it’s just a case of choosing the right fruits, vegetables, dried or ground herbs, and adding them to room temperature or boiling water in order to create the natural dye for the colour you’re wanting to achieve. Once that’s done you just soak hard-boiled eggs in the solution. The depth of colour is determined by how long the eggs stay in the solution. For best results, keep the soaking eggs in the refrigerator overnight to develop their colour as much as possible. Once they’re out of the solution and having been dried, it’s also recommended that you keep the eggs chilling in the fridge until you’re ready to display them. Boil your eggs first; remove them from hot water and let them cool. When they’re cool, rub the shells with white vinegar to help the dye take better to the egg. Create your dye solutions according to the instructions below. Place eggs in deep cups or bowls with the natural dyes and let sit for as long as you need to for the shade of colour you’re trying to achieve – leave them in longer for deeper colour saturation or for the deepest colour, leave the eggs in the solution overnight in the fridge. When you’ve got the colour you want, remove the eggs from the solution and blot them dry with a paper towel. Bear in mind that the final colour of your eggs will be affected by the colour of the egg itself. The difference between white and brown eggs is quite significant – the brown eggs will take on a much more muted colour tone when dyed. If you want a glossy egg, wait until your egg is completely dry and then take a cloth and lightly rub vegetable oil on them to create a gloss finish. Also, where I’ve noted that you need to add vinegar, that would be one tablespoon of white vinegar to every cup of strained dye liquid. 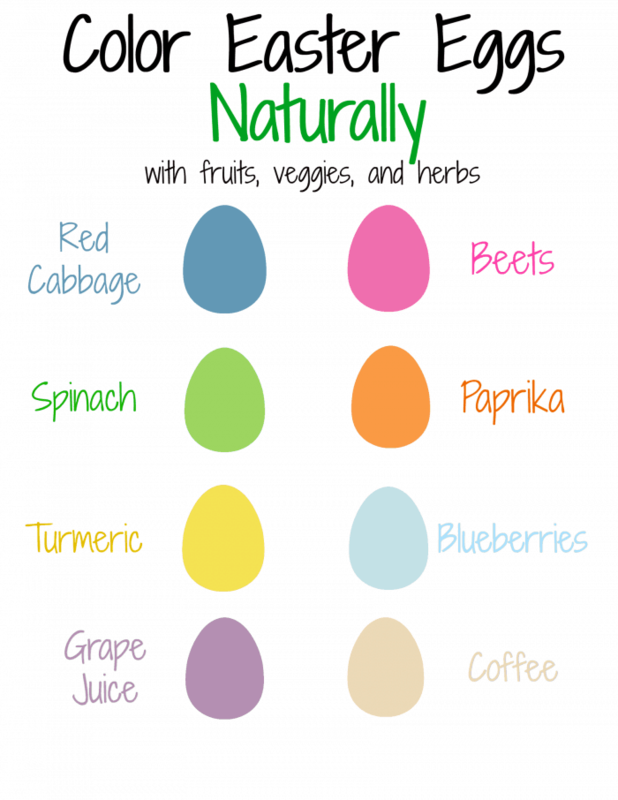 Blue: Use red cabbage to dye the eggs blue. Just cut 1/4 head of red cabbage into chunks and add to 4 cups of boiling water. Let cool to room temperature and remove cabbage with a slotted spoon. Add vinegar. Muted Blue: Mix 1 cup frozen blueberries with 1 cup water, bring to room temperature, and remove blueberries. Do not add vinegar. Green: Add a cup of spinach to boiling water. Add vinegar. Orange: Longer soaking of these onion-dyed eggs will help you achieve a darker colour. Take the skin of 6 yellow onions and simmer in 2 cups of water for 15 minutes, then strain. Add vinegar. Red-Orange: Stir 2 Tablespoons of ground paprika into 1 cup boiling water. Add vinegar. Mustard Yellow: Stir 2 Tablespoons of ground turmeric into 1 cup boiling water. Add vinegar. Light Yellow: Simmer the peel of 6 oranges in 1-1/2 cups water for 20 minutes then strain. Add vinegar. Dark Pink: Beetroot-dyed eggs will darken the longer they sit in the liquid. Cut 1 medium beetroot into chunks and add to 4 cups boiling water. Stir in vinegar and let cool to room temperature before removing the beetroots. Light Pink: Use the same solution as above for dark pink, but remove eggs as soon as they tint to the light pink colour you desire. Brown: Add 1 tablespoon of vinegar to 1 cup of strong, black coffee. Do not add vinegar. And if you’re wondering what to do with the hardboiled eggs once you’ve finished with your now beautifully decorated eggs (within a few days of boiling them) then I have a post that’s going to be right up your street later in the week!